Comfort bikes and mountain bikes are different styles of bicycles. 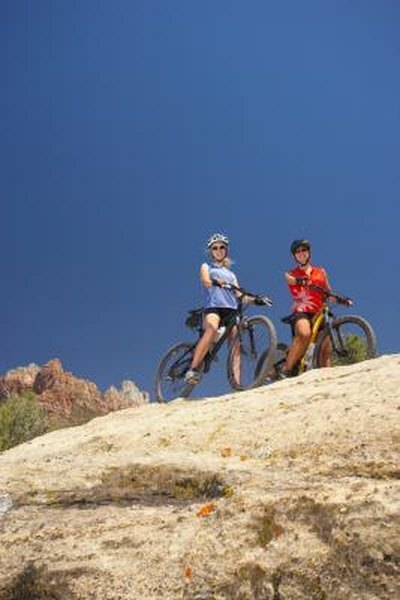 Mountain bikes are designed for off-road riding, while comfort bikes are designed for casual riding on pavement; both types are used on paved roads. Mountain and comfort bikes use the same size wheels, similar brake and gear parts and the same basic components of any other multi-geared bicycle. Manufacturers developed mountain bikes in response to the discomfort adult riders experienced on the sport-touring bikes of the 1970s and 1980s, with their drop handlebars and skinny tires. Comfort bikes were developed in the late 20th century for casual riders who did not like the increased performance- and competition-focused design of mountain bikes, which emphasized narrower saddles, longer top tubes and lower handlebars. Mountain bikes usually have sharp, angled frames, while comfort bikes may have curved angles in the top and down tubes. Mountain bikes have longer top tubes than comfort bikes, which causes you to adopt a more leaned riding position. The bottom brackets of comfort bikes are lower to the ground, for easier mounting and dismounting. When you ride a comfort bike, you sit upright, rather than slightly leaned over as you would on a mountain bike. The shorter top tube, taller handlebar stem and riser handlebars of a comfort bike enable this upright position. Both mountain bikes and comfort bikes frequently incorporate suspension seat posts and suspension forks, which absorb the impact of bumps and jolts and make for a smoother ride. Comfort bikes may have springs on the underside of the saddle instead of, or in addition to, a suspension seat post. The wide tires customary on mountain and comfort bikes also help absorb shocks. Both mountain and comfort bikes are generally heavier than road bikes, with typical weights between 25 and 35 lbs. Suspension features can add extra weight to both kinds of bikes when compared with road bikes or hybrid bikes. Mountain bikes and comfort bikes both use 26-inch tires, typically with a width of around 2 inches. Comfort bikes come with smooth tires, sometimes called “balloon” tires, similar to those used on beach cruiser bikes. Mountain bikes usually come with thick tread tires to grip complex terrain such as gravel, rocks, roots, mud and dirt, though smooth tires are also available for slick rock.